I promised myself and Reese that even if our schedule is quite hectic due to the recent move, we’ll have our very first Christmas tree setup for her. Keeping that promise in mind, we were off to the most populated area of Metro Manila (Divisoria) last Saturday to get Reese her very first Christmas tree. Seeing those sky-rocketing prices at the mall just added more reason to take this effort and it was SO worth it. 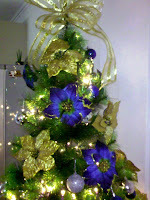 We only spent roughly 2,300 pesos for our 6ft Christmas tree and its decorations!